Once mom seems to finally get the hang of nursing or bottle feeding the baby…surprise, time to feed baby something new! 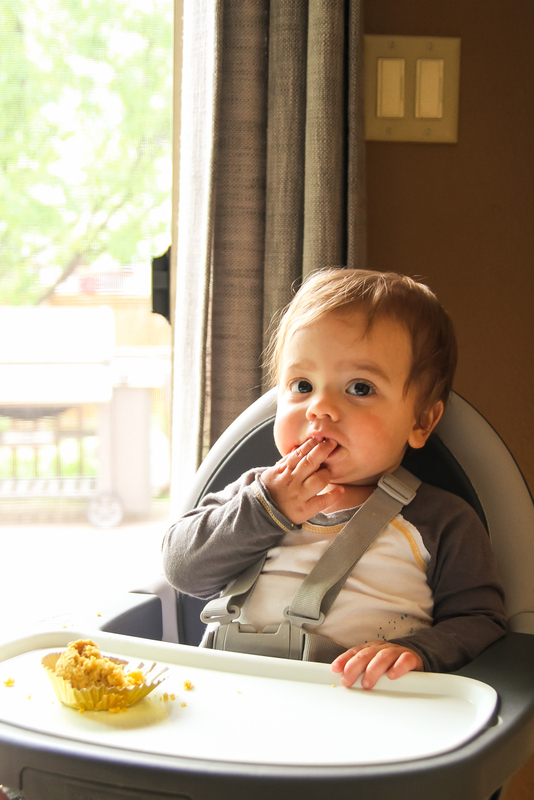 Many parents start babies on pureed foods and then transition to finger foods, while others skip over pureed foods and go straight to baby-led weaning. Whichever route one takes, at some point, the little one will need to try finger foods. This may be a confusing topic to many parents, but this article has mom and dad covered! We have compiled a list of 20 finger foods to put baby on. Some of these finger foods will come as no surprise for many parents, while some will be totally unexpected. We picked foods that are mommy and baby approved! This list contains different food groups, textures, and nutrients to ensure that mom and baby are picking the best of the best options. These foods do not take long to prep and are easy for busy parents, so that they can get healthy snack/meal options into their little one’s belly! Many of these ideas are perfect because baby can have the same thing that mom, dad, and the siblings are having for dinner, as well! Avocado is typically one of the first foods offered to baby when she starts eating solids. She can eat Avocado as a finger food as well. The soft texture makes it a great snack while your little one is still learning how to chew. It is best to cut up the avocado into small cubes before serving. HealthLine states that avocados are loaded with fiber, powerful antioxidants, and 20 different vitamins and minerals including Vitamins K, E, B6 and C! There are many benefits to giving your baby avocado and it is a great first finger food! Here is a tip, if the avocado is too slippery for baby to grab, roll it around in crushed up/dusted Cheerios for an easier hold! WholesomeBabyFood states that cheeses are typically offered to the non-allergic baby when he is between eight and ten months old. TheBump states to offer small bites of pasteurized cheese that is soft but not too stinky, such as cheddar, Colby jack, or Monterey jack. Offering your baby shredded cheese is a great option too. Parenting states that cheese is good for the teeth and is known to prevent tooth decay. In addition, cheese is rich in calcium which is needed for the development of strong bones and teeth. Cheese also is rich in protein which is needed for helping your baby grow. Gerber, HealthyBaby, BeechNut and many other brands have pre-made baby snacks on the market for your little one. Foods such as puffs, yogurt melts, and teething wafers are designed to help baby learn to chew by having a melt away texture. Many of these products include no artificial colors or flavors, and it best to do your homework to decide what is the best brand and product for your little one. These finger foods are easy, quick and perfect for parents on the go. Many of these snacks include ingredients such as sweet potatoes, kale, apple, strawberries and carrot. Pasta can be introduced to baby from 8 months of age, according to WholesomeBabyFood. Pasta is highly nutritious, and many pastas are enriched with minerals and vitamins. Making your own pasta or buying organic pasta is a smart choice whenever possible. This is a great finger food for babies because it is easy to pick up. It is best to cook pasta so that it is soft and easy for baby to gum or chew with his few teeth. You can add cheese (if your baby is at least eight months old) or even sauce (if baby is between 10 and 12 months of age). Peas are another typical first food given to babies when it comes time to start solids. Peas are super easy to steam or defrost and are the perfect size for little fingers to pick up and can easily be mashed between gums. According to HealthLine, peas are an excellent source of protein, antioxidants, fiber, folate, Vitamin K, and vitamin A. Peas are yummy, cheap, easy to make and usually well liked by babies. You can buy peas fresh, or frozen, but it is always best to aim towards buying organic if whenever possible. As baby gets older you can mix peas with chicken and even pasta! According to HealthyEating, broccoli has a ton of health benefits. Broccoli is a great source of Vitamins C and K and also a great source of fiber, potassium and folate! When it comes time to serve your little sweetheart broccoli, it is best to steam and cook it as much as possible so that it is soft enough for baby to gum with his mouth. This is a great option because baby can pick up broccoli by the stalk and easily put it in his mouth. Parents states that broccoli can be introduced to your baby at ten months or older due to the potential for gas in certain babies. HealthLine states that carrots are a great source of fiber, Vitamin B6, Vitamin K1, Biotin, Potassium and contribute to eye health. When preparing your carrots, it is best to either steam, roast or boil them and then dice or cut into a fry shape. Carrots can be offered between 6-8 months of age. It is best to purchase organic carrots or carrots grown in your garden, but if not, it is recommended to wash your carrots by using a vegetable brush and scrubbing under cool running water. Carrots are yummy and less harsh tasting than many of the other vegetable options out there. If your little one is ready for finger foods, pancakes are a great choice. If you search on Pinterest, you can find hundreds of super healthy baby pancake recipes. What you put in your pancakes should depend on how old your baby is and what foods he/she is ready to consume. Some parents make baby pancakes with baby cereal while other use banana as a base. It is up to you! Apple and Oat, pumpkin, applesauce, and strawberry are among the many flavor options available. 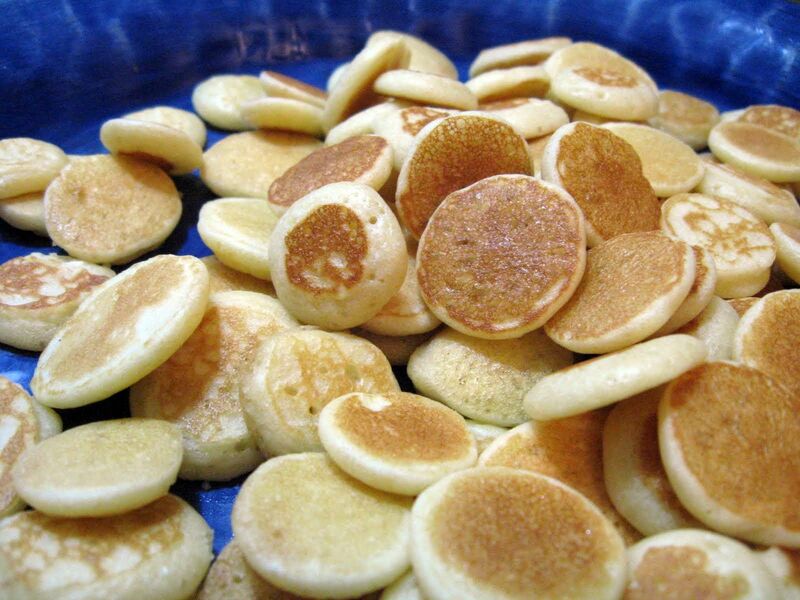 You can either make the pancakes bite sized or make normal sized pancakes and rip them into bite sized pieces! HealthLine states that babies can be introduced to eggs from seven months onward. Eggs are a great option because they contain tons of good nutrients such as phosphorus, folate, and Vitamins B2, B12, B5, A, D,E, and K. There are many ways to introduce eggs to your baby. You can give your baby bite sized pieces of hard boiled or scrambled eggs that can even be mixed with cheese and steamed veggies (such as broccoli or asparagus). Eggs are a cheap, easy, and nutritious way to get your baby used to finger foods. Some parents add water, infant formula or breast milk to the egg mixture before cooking to make the eggs easier to mash for beginners. Bananas are a great finger food for baby! It is best to cut the banana into small bite sized pieces so your little one won’t choke. WholesomeBabyFood states that you can introduce banana to your baby when she starts solids at 6 months old. If the banana is too slippery for your baby to grasp it is recommended to roll the pieces in dusted cheerios to make it easier to grasp. Bananas are super yummy and healthy option for your baby. Bananas contain a good amount of fiber, antioxidants, potassium, and several vitamins. Your little one will probably love this finger food! WholesomeBabyFood states that meat can be introduced when your sweetheart between 6-8 months old. OrganicFacts states that chicken is well known for its protein content and is also rich in vitamin B and D. TheBump says that diced chicken breast is pediatrician approved as finger good for baby. It is best to make sure your chicken is cooked thoroughly and cut into bite sized pieces. Be wary about seasoning your chicken too much before age 1 because it may be too harsh on baby’s belly. Pair chicken with some cut up carrots, asparagus, or broccoli and you have a great dinner for your little one! TheBump states that dry O shaped cereal helps babies practice their pincer grasp. O shaped cereal, such as Cheerios, mix well with saliva and are easy for baby to manage in their mouths without choking. This is a very easy snack that is perfect for breakfast or on the go! Cheerios are a great source of whole grain and contain protein and fiber. It is best to stick with plain cheerios and avoid the honey nut ones (unless baby is at least a year) due to allergens. Cheerios are yummy, convenient and a win-win for mom and baby. WholesomeBabyFood states that blueberries can be offered to your little one around eight months of age. Blueberries are a super food and are a perfect finger food for your little one. Although blueberries may turn those cute little fingers purple, they are soft, small and easy to gum, healthy and oh-so delicious. HealthLine states that blueberries are nutrient dense containing manganese, Vitamin C, Vitamin K and fiber. Blueberries are widely known for the antioxidant properties and are a great option for your little one. Aiming to buy organic is always the best option, but if that is not possible, it is fine. WholesomeBabyFood states that green beans are recommended between months 6-8. 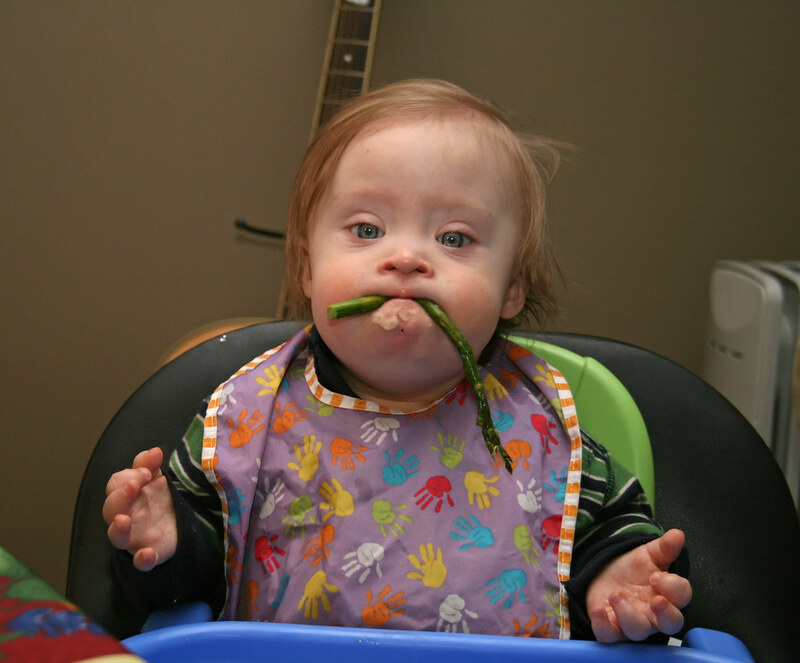 Green beans are typically one of the first foods offered to baby when they are introduced to solids. Parents states that when serving green beans as finger foods, you must ensure that the green beans are soft enough after they are steamed. A good way to test is to try to squash them between your two fingers, if they turn to must then they are cooked perfectly. MedicalNewsToday states that green beans are rich in vitamins A,K and C, iron, fiber and folate! This is a great finger food for your little one. Beans are great for babies to practice their pincer grasp. It is best to try small beans with thin skins such as black, pinto or cannellini beans. It is best to avoid canned beans due to the high level of salt. To make beans baby-friendly it is best to cook them until they are very soft. 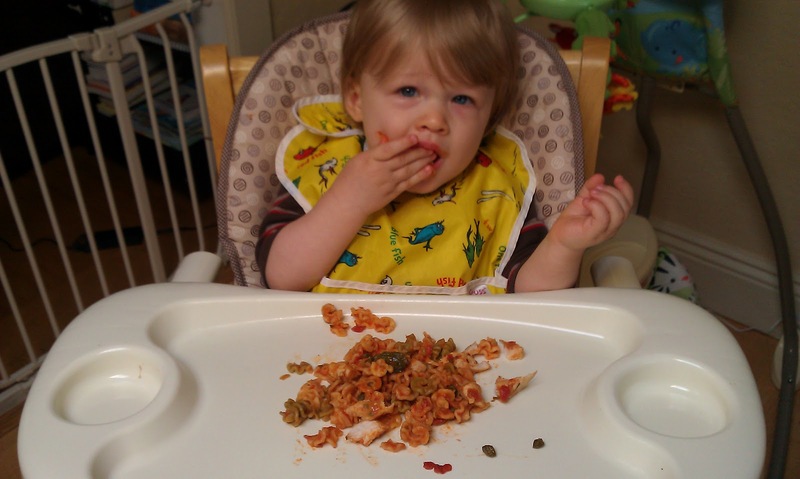 Once baby is old enough for mixed dishes, adding beans to soups and stews is a great choice. Beans probably are not most parents first thought when it comes to finger foods, but beans are healthy, yummy and perfect for tiny fingers. HealthLine states that sweet potatoes are a great source of vitamin A, vitamin C, manganese, and vitamin B. Not only are sweet potatoes absolutely delicious, but they are super healthy, which is a win-win for mom and baby. You can buy sweet potatoes frozen, which is super convenient for a busy mama. If you buy sweet potatoes fresh, it is best to steam, roast, or bake them. Cut your sweet potatoes into cubes for your little one to pick up with his/her fingers. It is important that your sweet potato is cooked enough so baby can mash it with his/her gums. If you want to make your own baby snacks at home, muffins are a great choice. There are tons of websites out there that have super yummy and healthy flavor options just right for your little baby. We found a great recipe on MyKidsLickTheBowl for apple, banana and carrot muffins which require a handful of ingredients to make moms and baby's super happy! This is a great way to hide veggies in your kiddo’s food if your child has a hard time with vegetables when they get older. Many recipes on the internet contain good foods for your little one such as avocado, apple, carrot, banana, spinach, zucchini, sweet potato and many more options. 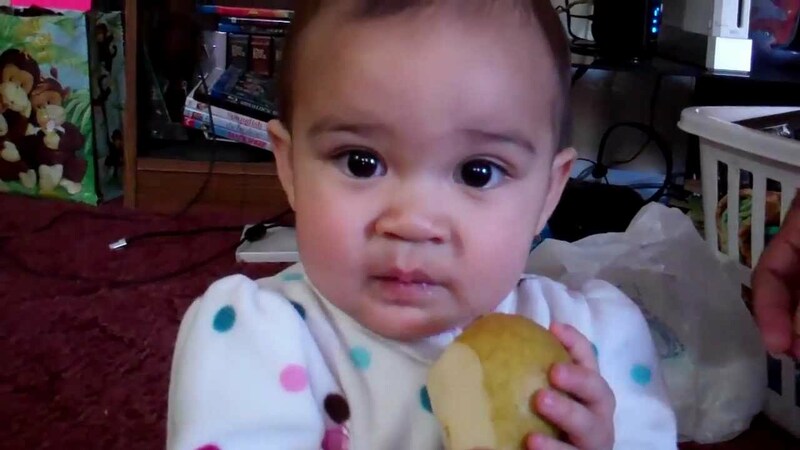 WholesomeBabyFood states that pears can be given to your little sweetheart starting at age six months. 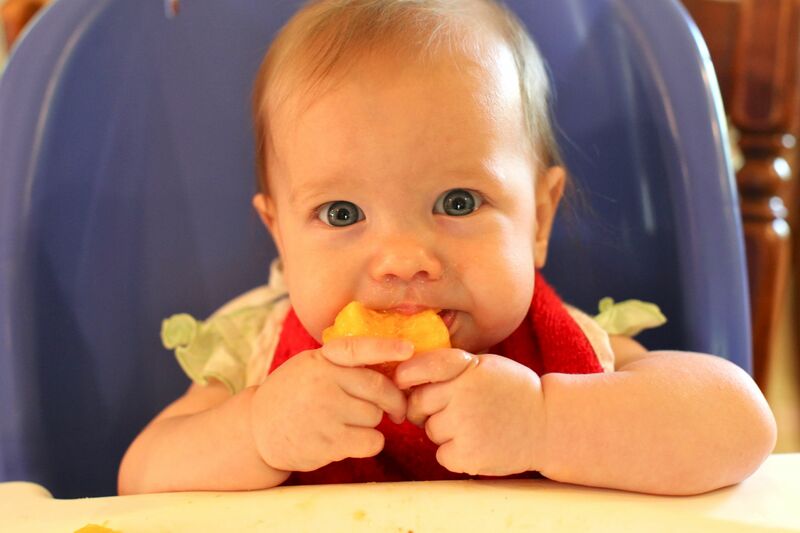 Not only are pears yummy, but they are an excellent finger food for your baby! You can simmer, steam and even bake pears to get them to a soft texture for baby. Of course, we recommend pealing the skin of the pear and getting rid of the core. Cut your pear into bite sized pieces and let baby enjoy! OrganicFacts states pears are a great source of B-complex vitamins, fiber, magnesium, phenolic compounds, vitamin k, potassium and vitamin C. This is a healthy, yummy, and easy finger food for your baby. HealthLine states that tofu contains all of the essential amino acids your body needs. Tofu also has a wide variety of vitamins and minerals along with a high amount of protein. According to WholesomeBabyFood, it is best to slice tofu into small cubes that are suitable for your baby and crush up cheerios to roll or toss the tofu in to make it easier for baby to pick up. Tofu is not suitable for a baby who has an allergy to soy, but babies eight months and older with no known issues can consume tofu. Tofu is healthy and a great way to introduce baby to different types of food.